After killing an alpaca at a Malibu winery in late 2015, he was captured and fitted with a G.P.S. collar by the National Park Service, which designated him the forty-fifth subject in a long-running study, led by a wildlife ecologist named Seth Riley, on the mountain lions of Los Angeles. (The “P” comes from Puma concolor, the species whose common names include puma, panther, catamount, cougar, and mountain lion.) Since P-45 was collared, according to Phillips, he has killed some sixty goats, sheep, llamas, and alpacas, a miniature horse, and a four-hundred-and-fifty-pound heifer: members of the class of rustic pet known as “hobby animals.” Gallingly, he has eaten little — a nibble of heart meat here, a nip of scrotum there. Except in the case of pygmy goats, for which he has a taste, he seems to kill for sport. The Santa Monica Mountains extend from the Pacific Coast through the Hollywood Hills, to end in Griffith Park. Urban though Los Angeles is, its mountains are furrowed with densely vegetated canyons full of deer and coyotes, cactuses, live oaks, wheeling hawks — a patchwork of public and private holdings claimed both by top carnivores and by their human counterparts. The real estate is increasingly contested. At some two hundred and forty square miles, the range is the perfect size for one or two dominant males and several females, along with their young. The National Park Service study is currently tracking ten mountain lions in the area, including three breeding males. There is also an unknown number of uncollared lions. Living at such close quarters intensifies the lions’ natural territorialism; in this population, the leading cause of death is conflict with other lions. But adolescent lions who set out in search of their own hunting grounds often come to an impasse. The range is bounded by the Pacific Ocean to the south and the Hollywood Freeway (the 101) to the north, and bisected by the 405 between Brentwood and Bel Air. Just as the roads keep native lions in, they also keep outside lions from entering, and first-order inbreeding has become common. Lush but confined, the mountains are a cushy prison, a Hotel California for apex predators, whose future is threatened by a double deficiency: not enough space for a group of lions with not enough genetic differences among them. As a result, the mountain-lion population in the Santa Monica Mountains is in danger of entering an extinction vortex, a downward spiral in which everything starts to fail. “They could be in the process of genetic flatlining,” Robert Wayne, an evolutionary biologist at the University of California, Los Angeles, says. 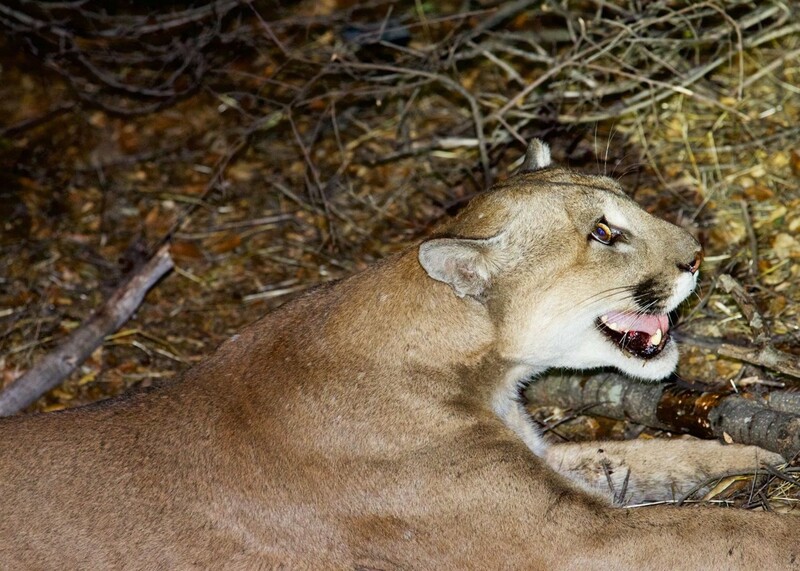 “Without our assistance, the Santa Monica Mountain pumas are likely to go extinct.” This is what nearly happened to the Florida panthers, in the mid-nineties, when intensive inbreeding caused physical changes that hindered reproduction. According to Riley, who recently published a paper on the subject, if similar problems occur and no new lions enter the area the likelihood of L.A.’s lions disappearing in fifty years is 99.7 per cent. But genetic rescue can come in the form of just one new animal in each generation — in Florida, where the population was larger, it took just six females from Texas to reverse the spiral. P-45’s alien provenance aggravates the unease that Phillips and his neighbors feel. “I know P-45 is not indigenous to here,” Phillips told me. “I think he was a killer someplace else.” He added, “I’m not too happy about P-45’s genes getting passed down.” Though the young generally travel with their mothers — mountain-lion fathers are more likely to kill their kittens than to train them — he saw the potential for P-45 to accustom his offspring to a life of theft and slaughter. Besides, he said, “I’m tired of living inside a biology project.” If the California Department of Fish and Wildlife, which manages the state’s mountain-lion population, or the National Park Service, which he blames for protecting P-45, refused to solve the problem, he warned that vigilante justice would prevail. Puma concolor, an evolutionary adept that, unlike the sabre-toothed cat, survived the Late Pleistocene Extinction, is found from Tierra del Fuego to the Canadian Yukon. Until successive extermination campaigns largely eradicated mountain lions from the Midwest and the East, they ranged throughout the United States. Now, as urbanization in the West encroaches on their remaining habitat, some are making audacious attempts to reclaim ceded lands. In 2011, a cat from South Dakota travelled more than fifteen hundred miles, to Greenwich, Connecticut, before being struck and killed by an S.U.V. on the Wilbur Cross Parkway.